The following Terms and Conditions ("Terms") are applicable to Martins Caterers (Martins). The martinscaterers.com website is referred to generically herein as the "Website". The services provided by Martins via the Website (other than third party websites accessible via the Website) are subject to these Terms and any policies that may be published by Martins from time to time. The Terms and any applicable policies comprise the entire agreement between you and Martins and supersede all prior agreements regarding the subject matter contained herein. BY USING THE WEBSITE, YOU AGREE TO BE BOUND BY THE TERMS. IF YOU DO NOT WISH TO BE BOUND BY THE TERMS, IMMEDIATELY DISCONTINUE USING THIS WEBSITE. Martins makes various services available on the Website, limited to, the capability to purchase tickets for events. Ticket Fees for the various events are set out on the Website. You are solely responsible for providing, at your own expense: (i) all equipment, including a computer and modem; and (ii) your own Internet access, for the purpose of purchasing tickets through the website. The entire content of the Website in aggregate is owned by Martins , and protected as a collective work under United States , Canadian, and international intellectual property laws, treaties and conventions, including the Berne Convention for the Protection of Literary and Artistic Works. The copying, reproduction, or publication of any part of the Website is prohibited, unless expressly authorized in writing by Martins. You acknowledge that content, including but not limited to text, music, sound, photographs, video, graphics or other material contained on the Website ("Content") is owned or licensed by Martins and other third parties and is protected by copyrights, trade-marks and/or other rights and laws. You may download the material available on the Website for your personal, non-commercial use only. Except as may be permitted by copyright law, you are responsible for obtaining permission from the copyright owner before reusing any copyrighted material that is on the Website. In the event of any permitted copying, redistribution or publication of copyrighted material from the Website, no changes in or deletion of author attribution, trade-mark legend or copyright notice shall be made. You acknowledge that you do not acquire any ownership rights by downloading copyrighted material from the Website. All notices to you may be given by any means including, but not limited to: (a) email; (b) conventional mail; (c) notices or messages posted on the Website; or (d) any other means by which you obtain notice thereof. Martins is not responsible for the content of any third party website which you access through the Website. If you decide to access any such third party website, you do so entirely at your own risk. Martins reserves the sole right to either modify or discontinue the Website, including any features therein at any time with or without notice to you. Without limiting the foregoing, Martins may, from time to time as it reasonably determines, modify the services, change the pricing structure, add or remove non-fee and fee based services. Martins shall not be liable to you or any third party should Martins exercise such right. You agree to indemnify and hold Martins, its subsidiaries, affiliates, directors, officers and employees, harmless from any claim or demand, including reasonable legal fees and expenses, due to or arising out of your use of the Website, which cause direct or indirect damage or harm to a third party. YOU EXPRESSLY AGREE THAT YOUR USE OF THE WEBSITE IS AT YOUR SOLE RISK. THE WEBSITE IS PROVIDED ON AN "AS IS" AND "AS AVAILABLE" BASIS. MARTINS EXPRESSLY DISCLAIMS ALL WARRANTIES AND CONDITIONS OF ANY KIND , WHETHER EXPRESSED OR IMPLIED, INCLUDING, BUT NOT LIMITED TO THE IMPLIED WARRANTIES OF MERCHANTABILITY, FITNESS FOR A PARTICULAR PURPOSE AND NON-INFRINGEMENT. MARTINS MAKES NO WARRANTY THAT THE WEBSITE WILL MEET YOUR REQUIREMENTS, OR THAT ACCESS TO THE WEBSITE WILL BE UNINTERRUPTED, TIMELY, SECURE, OR ERROR FREE; NOR DOES MARTINS MAKE ANY WARRANTY AS TO THE RESULTS THAT MAY BE OBTAINED FROM THE USE OF THE WEBSITE OR AS TO THE ACCURACY OR RELIABILITY OF ANY INFORMATION OBTAINED THROUGH THE WEBSITE. YOU UNDERSTAND AND AGREE THAT ANY MATERIAL AND /OR DATA UPLOADED, DOWNLOADED OR OTHERWISE OBTAINED THROUGH THE USE OF THE WEBSITE IS DONE AT YOUR OWN DISCRETION AND RISK AND THAT YOU WILL BE SOLELY RESPONSIBLE FOR ANY DAMAGE TO YOUR COMPUTER SYSTEM OR LOSS OF DATA THAT RESULTS FROM UPLOADING AND /OR DOWNLOADING SUCH MATERIAL AND /OR DATA . MARTINS MAKES NO WARRANTY REGARDING ANY GOODS OR SERVICES PURCHASED OR OBTAINED THROUGH THE WEBSITE. MARTINS SHALL NOT BE LIABLE TO YOU FOR ANY DIRECT, INDIRECT, INCIDENTAL, SPECIAL OR CONSEQUENTIAL DAMAGES RESULTING FROM THE USE OR THE INABILITY TO USE THE WEBSITE INCLUDING ANY DAMAGE THAT RESULTS FROM UNAUTHORIZED ACCESS TO OR ALTERATION OF YOUR TRANSMISSIONS OR DATA. All ticket fees will be charged directly to your credit card account and are due in advance of the event. Martins does not provide refunds for any reasons. As detailed above, Martins reserves the right to change its fees in accordance with the section above entitled "Modifications to Website." All sales are final. Inquiries should be made directly to the location your tickets are for. 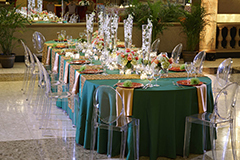 Your bridal hostess is with you throughout the event, attending to your every need. Kudos to Martin's West. You made our wedding day extra special!! Thanks to everyone involved. Contact us today and tell one of our event planners what you have in mind for your dream wedding.